Cosmetic dentistry brings together medical practice with your desire to smile with confidence. Your smile is the first thing people notice about you, so it only makes sense that you want it to be as attractive as possible. Unfortunately, not everyone was blessed with great teeth. You may have permanent stains on your front teeth, a chip or crack, obvious tooth decay, or you prefer to have tooth colored fillings rather than metal ones. These are just some of the reasons that men and women undergo a cosmetic dentistry procedure to enhance the appearance of their teeth and smile. Porcelain Veneers: This cosmetic dentistry procedure is a non-invasive way to cover minor tooth imperfections such as discoloration or cracks. A porcelain veneer is an extremely thin piece of ceramic material that your dentist cements to the front of your tooth. Before doing so, Dr. Ahmed must first remove less than a millimeter of tooth enamel to ensure that the veneer fits comfortably on the front or top of your tooth surface without protruding further than the rest of your teeth. Teeth Whitening: Alpha Dental is pleased to offer ZOOM! Professional teeth whitening to eliminate stains from coffee, soda, tobacco, medication, and dark foods. In less than an hour, your teeth could be up to eight shades brighter. With your nice white teeth, you won’t be able to hold back your smile. ClearCorrect Invisible Aligners: If your teeth are improperly aligned but you don’t want to undergo orthodontic treatment with traditional metal braces, ClearCorrect is the solution. This alternative to standard braces uses a set of clear plastic aligners to straighten your teeth over the course of approximately 18 months. Every two weeks, you replace your current aligner with a new one. Each aligner slowly moves your teeth into a new position. You should plan to wear them at all times except when eating or brushing your teeth. Composite Fillings: When you need to have a cavity filled, the dentists at Alpha Dental use fillings made of porcelain or resin rather than traditional metal fillings. Since these materials closely match the color and shade of your teeth, they are barely noticeable. You can also request your dentist to replace your current metal fillings with porcelain or resin. Some patients do this because they feel metal fillings draw too much attention to their mouth while others are concerned about the effect of metal fillings on their oral health over time. 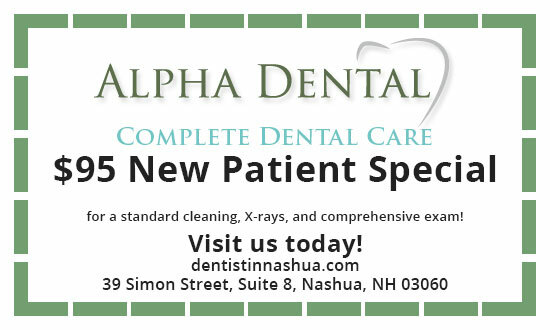 At Alpha Dental, we work with you to achieve the smile you’ve always wanted. Please schedule a consultation today to learn more about how you can improve this important aspect of your appearance.